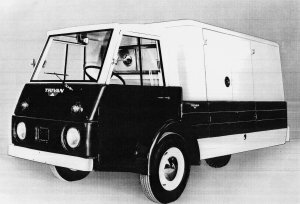 Manufactured in 1962 by the Roustabout Company in Frackville, Pennsylvania (USA) the Trivan was a 3-wheeled lorry with a fully enclosed cab for two people. With seven years of testing, the vehicle was designed by C. Harry Payne, who was also became known as The father of the Jeep*, the originator of the military Jeep in 1939 that was used so heavily during World War II. The Trivan’s power came from either a Kohler 32hp 2 cylinder 4 cycle air cooled petrol engine or a 30hp 2 cylinder 2 cycle air cooled diesel engine that powered the single rear wheel. Both engines gave the vehicle a maximum speed of around 55 mph. The Trivan had a fiberglass body attached to a heavy duty steel tube chassis and airbag suspension. All models had an open pick up type rear body with drop down sides. 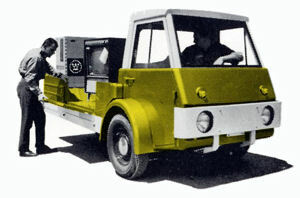 A fully enclosed rear body was designed for a prototype but never manufactured. Production ceased in 1964 after 112 vehicles had been made. A number of them were purchased by East Coast Trailways affiliates. The Trivan with prototype body.